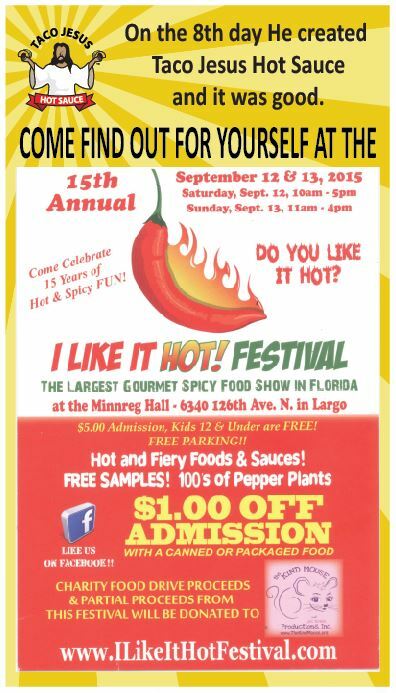 Taco Jesus Gourmet Foods will be having our big Florida debut this weekend at the I Like It Hot Festival in Largo, FL. We look forward to meeting as many hot sauce disciples as possible and to spread the Taco Gospel far and wide. We’ve got two great new sauces and a gourmet taco seasoning that we will be rolling out at the festival. We will also be selling some awesome special edition and limited edition bottles exclusively made for this show. We hope you can make it out to see us, but if not you can stick pick up your share of Taco Jesus goodness over at our online store. Come out out and see us if you can, and if not, fire up your browser or smart phone and get your order in online! This entry was posted in Message from Taco Jesus and tagged festival, florida, hot sauce, i like it hot, largo, limited edition, special edition, tacos by Taco Jesus. Bookmark the permalink.